At No9 we have a team approach to looking after our patients. We are all trained to a very highstandard in different areas. Working together well we can find the best individual solution for you. I have always loved my dentistry, particularly learning new techniques so people have more options of how their teeth can be treated. After being a dental nurse for 10 years I decided to train to become a Hygiene Therapist. Calum is the newest member of our team. He has a great interest and experience in root canal (endodontic) treatment. I have been working here at No9 for well over 10 years as a dental nurse and Care-coordinator. Seeing your happy confident smiles that make me smile! I look forward to welcoming you to the practice as the receptionist at No9. I am usually in the background trying to ensure everything is running well. I love chatting with patients and helping them find the best treatments. When you walk through the door I will often be there to greet you. Anna is the newest member of our staff, growing the reception team. Cheryl had just qualified as a dental nurse when she joined us. Our practice has evolved over 15 years. We have many long-term success stories, however our emphasis on constant improvement has allowed us to further develop using the latest technology and techniques. You can trust us to provide excellent treatment . 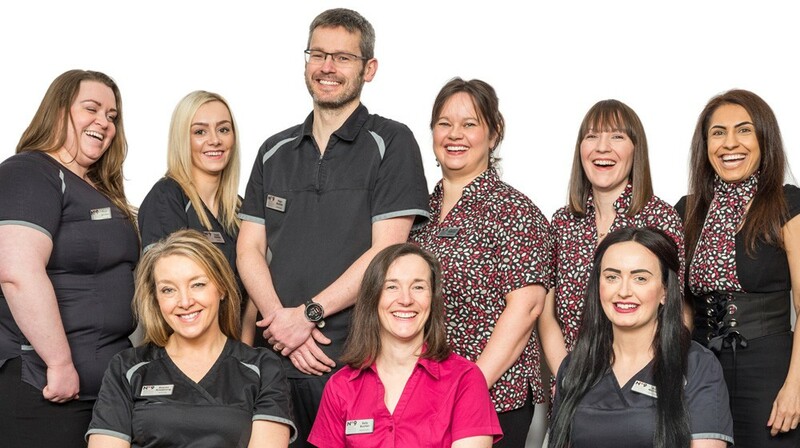 Pete is one of only 2 dentists in Scotland to be Accredited by the British Academy of Cosmetic Dentists. Over the years we have consistently won both Scottish and UK awards recognised by the wider dental community. These have been for various different aspects of our work, including cosmetic treatments. We have won awards for our Teamwork and Patient Care, as well as our Clinical Cosmetic and Implant work.